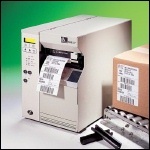 The 105SL offers flexible connectivity solutions including ZebraNet® Wireless Print Server for 802.11b wireless connectivity that frees you to move or reconfigure the printer without costly recabling, plus ZebraNet 10/100 Print Server, which offers a complete wired solution for the 105SL when using 10Base-T, 100Base-TX, and fast Ethernet 10/100 auto-switching networks. And with the new ZebraNet™ Bridge, gain the efficiency of centralized printer management. Model 10500-2001-0070, 203 DPI, 8 IPS Print Speed, 6MB DRAM, 4MB Flash, Serial, 10/100 Prt Server, US Plug, ZPL Language. Model 10500-2001-1000, 203 DPI, 8 IPS Print Speed, 6MB DRAM, 4MB Flash, Cutter, Serial, Parallel, US Plug, EPL Language. Model 10500-2001-2000, 203 DPI, 8 IPS Print Speed, 6MB DRAM, 4MB Flash, Peel w/ rewind, Serial, Parallel, US Plug, ZPL Language. Model 10500-3001-0000, 300 DPI, 8 IPS Print Speed, 6MB DRAM, 4MB Flash, Serial, Parallel, US Plug, ZPL Language. Model 10500-3001-0070, 300 DPI, 8 IPS Print Speed, 6MB DRAM, 4MB Flash, Serial, 10/100 Prt Server, US Plug, ZPL Language.